Beautifully engraved Certificate from the Greyhound Computer Corporation issued no later than 1982. This historic document was printed by the Security Banknote Company and has an ornate border around it with a vignette of an old computer with a woman sitting on a tape. This item has the printed signatures of the company's officers and is over 21 years old. Greyhound Computer Corporation is often quoted in anti trust cases. They has a successful outcome against IBM's computer monopoly, resulting in a pretrial settlement in excess of $21 Million. In Greyhound Computer Corp., Inc. v. IBM 3 Computer L. Serv. Rep. 138, 139, it was found that information provided must be in a "reasonably usable form," and courts will ensure that the party requesting the information is able to access the data. 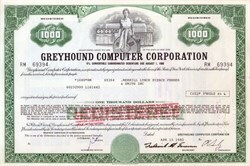 IBM provided computer tapes that the Greyhound Corporation was unable to read, and the court ordered IBM to assist the Greyhound Corporation in accessing the information with materials and personnel. Greyhound Computer Corporation merged into the Greyhound Corporation in 1976. The Greyhound Corporation changed its name to the Dial Corporation in 1990. In 1996, the Dial Corporation changed its name to Viad Corporation. Viad Corp. operates two business segments which provide: Payment Services, Convention and Event Services. VVI also provides Travel and Recreation Services. Viad is a $1.8 billion corporation dedicated to the expanding services industry worldwide. Viad companies are leaders in their markets and are focused on the areas of payment services and convention and event services. Although the company has only carried the Viad name since 1996, it has a decades-long lineage illustrative of corporate penchants for acquisitions and spinoffs. In the 1960s Greyhound Corporation (later renamed Greyhound Lines and subsequently acquired by Laidlaw) began diversifying beyond transportation as airline and auto travel became less expensive and more popular. Greyhound bought a string of companies that eventually would come under the Viad umbrella. Among its purchases were Restaura (contract food service, 1964), Brewster Transport Company (Canadian travel services, 1965), Travelers Express (financial services, 1965), Aircraft Service International (aircraft fueling, 1968), Exhibitgroup (exhibit products and services, 1968), GES Exposition Services (convention services, 1969) and Greyhound Computer Corporation in 1976. When Greyhound acquired Armour and Company in 1970, it branched into meat processing and added the US's most popular soap, Dial, to its holdings. Greyhound subsequently sold all but the meat processing and consumer businesses acquired in the deal. Diversification in the 1980s brought into the fold Glacier Park (lodging in Glacier National Park, 1981), Jetsave (travel agency, 1986), and Dobbs International (airline catering, 1987). Greyhound also launched Premier Cruise Lines in 1983. Greyhound sold its bus line in 1987 and changed its name to Dial Corporation in 1991. Five years later Dial split into two publicly traded companies: a new Dial, which retained all of Dial's consumer products, and Viad (from the Latin "via," signifying movement), the renamed original company, which retained Dial's service companies (Restaura, Dobbs International, Brewster Transport Company, Travelers Express, Greyhound Leisure Services, Aircraft Service International, Exhibitgroup/Giltspur, GES Exposition Services). Viad also kept a $10 million investment in baseball's Arizona Diamondbacks. Viad soon began narrowing its focus. In 1997 it sold UK-based travel agencies Jetsave and Crystal Holidays, as well as Premier Cruise Lines. In 1998 it shed Greyhound Leisure Services and Aircraft Services International. While it was trimming its noncore holdings, it strengthened its existing focus by buying trade show contractor ESR Exposition Services, German exhibit company Voblo, and wire-transfer giant MoneyGram in 1998. Viad continued divesting noncore holdings in 1999 by selling most of Restaura to ARAMARK (Viad retained some leisure and entertainment food service operations, such as its Glacier National Park facilities). It also exited the airline catering business by selling Dobbs to SAirGroup.